I wonder how he'd play in a 8th Infantry Pathfinder build. Basic Marching Order Benefits and then a fair special attack? Pathfinders only works with Jandar Soldiers. Here is the PDF for Jarek Guy. I don't have an obscure quote to lead off this one, so it's just straight into the reviewing. Will this tricky Elf sneak his way into the Soldiers of Valhalla? Or will they see through his facade and send him on his way? Stat wise, Cormin doesn't have much going for him. He has a reasonably high attack I suppose, but it's not really out of line for a figure at his point value, especially considering he's stuck with a negative power like Stab in the Back. Other than that, he just has Façade to help keep him from dying horribly. Overall, certainly nothing here that stands out as broken or overpowered. An Elf fighting for Utgar works fine for me, there is already precedence with Elaria and I'm not a fan of having a race tied to only one general/culture in the first place. Façade works thematically, but only if we assume it is a creative name for a magical 'teleport swap' of some type and not just a literal disguise. I always visualized it as something akin to the Substitution Jutsu from Naruto personally, just with robotic rats instead of logs, which makes the power seem pretty awesome really. Stab in the Back is a good fit for a Utgar Rogue, and it gives him some interesting play with Elaria. I'm guessing there's a story there, which wouldn't be the first time two Utgar characters had a thing. Utgar is for lovers apparently. Façade is an interesting power that does something new, Stab in the Back is a power worth reusing on occasion. Not much else to say, pretty solid here overall. I found Cormin rather niche. He's filler, but he's really only viable in specific builds. For starters, he's terrible in the traditional filler role of last man standing. While the likes of Isamu or even Brave Arrow have a chance to pull out the come back win with their defensive powers, Cormin needs friendlies for Façade to do anything. 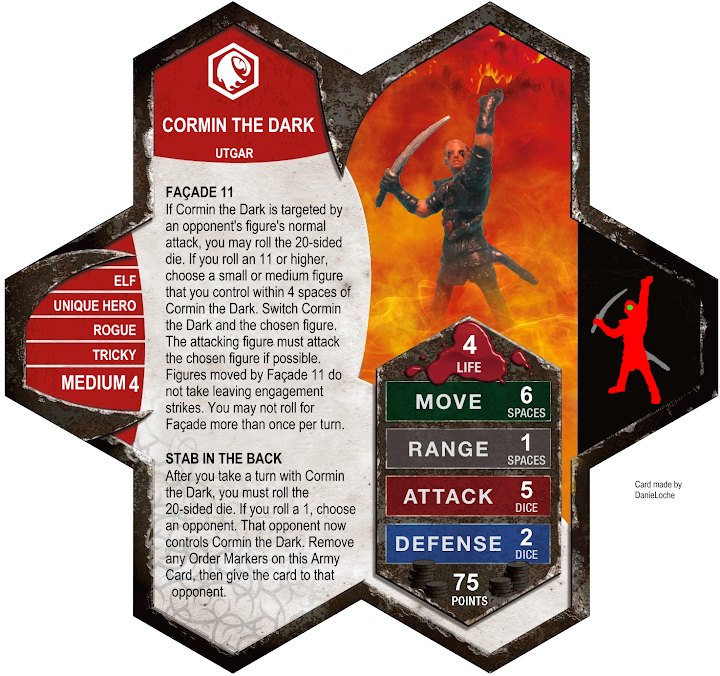 As clean-up, Cormin is just a figure with a slightly above average attack, mediocre defense and a 5% chance of losing you the game on your own turn. You really need units that benefit from being attacked to get the most out of Façade, units with powers like Counterstrike or Scatter. Pairing him with high defense units doesn't really accomplish much beyond possibly locking-down a unit for a while, and considering Cormin isn't anything special in the move department, you probably could have just moved the high defense figure into engagement with the target in the first place. As an 'extra' Deathreaver or Samurai, Cormin becomes more useful, though it's still hard to justify moving him up over your other units. I found he really shines in a Ornak build with some Deathreavers around, as a cheap extra target for Ornak's Red Flag of Fury that can also act as a 'Deathreaver' when attacked, Cormin can really earn his points. My main concern with Cormin isn't his draftability or balance though, it's Façade's potential to create ridiculously long and complicated turns. Combined with enough other powers that trigger during or after an attack, things can get tedious and confusing. Fortunately, there aren't enough powers that exist in that space for it to be a major issue yet (just be careful if you're doing some sort of C3V/C3G crossover), but I feel any unit that plays in those waters needs to really earn his spot. I feel there is a finite amount of room for units like that in the game. I feel that Cormin is on the edge here, but I think he is just interesting enough (and low-impact enough, given he is just a cheap filler hero and not a common squad or centerpiece figure) that he is worth whatever limits Façade may place on future design space. Cormin isn't an everyday kind of unit, you can't just throw him into an army on a whim and get that much out of him, but I feel he is an interesting addition to the builds he works with and a worthwhile addition to the game as a whole. I vote to induct Cormin the Dark to the SoV. Balance- Asterios adds a lot of anti-squad punch to any army. I found that even if the rest of my army took more damage than they dealt, Asterios could still bring back the game if the other army had been cleared of its heavy hitters. Against squads he is harder to take down than a Hydra, having more life. He also packs a similar, albeit lesser, punch to a Hydra, making a tradeoff in number and degree of attacks for more mobility. However, when he has to face off against heroes he is considerably more vulnerable, since his powers are (mostly) nullified. Altogether I found him to fit nicely alongside the other 120 point heroes. Playability- I liked to play Asterios alongside Raelin and sturdier squads like the Shieldsmiths. Whatever the rest of my army was, I usually used it to try to take down anything that might threaten Asterios--usually enemy heroes, particularly the ones with big attacks. Meanwhile my opponent usually tried to take Asterios out before the end-game. Whichever of us succeeded first didn't necessarily always determine the winner, but they certainly had an edge. Asterios at full health against anything short of an overwhelming number of Small- or Medium-sized figures makes any opponent a little uneasy. Powers: Both powers are appropriately themed and scaled. Each of them applies restraint and originality in appropriate doses. Appropriate Stats: The stats all feel right. Visual Distinctness: Heroscape has no other Minotaurs, and this one looks great. Creativity- A new twist on an old power combined with a simple new power, both in service to a cohesive theme? I like the application of creativity here. Theme- The theme on this card is pretty cool. Asterios has by no means cornered the market on Minotaur-themes, but what he has works well. I found Asterios to be a well-designed and balanced unit that felt thematic and interesting. I vote Yea to induct Asterios into the Soldiers of Valhalla. Hooray ! That brightens up my Monday morning. Nice to see another yes for the Minotaur ! These little buggers can do some damage if the swarm manages to lock the enemy down. The question is, for their low point cost, do they do enough (creatively, thematically, and in actual gameplay) to earn a spot in Valhalla? The Ants are a cheap 4-man squad, worth 10 points apiece. They share that designation with one of the game’s love to hate squads, Deathreavers. Both squads have a movement power that allows them to keep the front line “full”, although the Ants’ is more active and the Rats’ is more passive. The Ants give up 2 defense and Disengage for extra attack power, both in abilities and base stats. All in all, the ants seem to fill a different role than the reavers, but they stack up comparably balance-wise. Giant ants fit Heroscape just fine. We already have giant spiders and a giant insect (Sujoah) so that works. They’re apparently natives of Valhalla, which makes sense as that is where the Fyorlags are from. Ants in nature often are very organized and militaristic, so I like the class of soldiers here. The playstyle they lend themselves to is very relentless, so that fits well. The only thing I thought was slightly off was their move. I really expected it to be 7, and I kept thinking it should have been higher. I got used to it after a while, and it has good gameplay reasons, so it worked for me after some adjustment. Aunstrom is a region of Valhalla referenced in official backstory/fiction, so that makes perfect sense. Horde Attack really worked well as a way to keep the Red Ants up in the action, and Cutting Mandibles gave them incentive for staying engaged with their opponents. Both powers are easy to understand after a single reading, and both powers communicate the theme well in a very creative way. The Red Ants are interesting to evaluate, because each figure is so inexpensive, and so it’s sometimes hard to tell their full impact on a game. They also have a few different uses possible, as a kind of shark squad or as a screen, which is a fascinating dichotomy, as those are usually thought of as opposites. However, they can work as a screen (especially against low-attack figures), because you can continually bring more Ants up without losing attacks. If your opponent is rolling hot attack dice, that doesn’t work so well. An engaged Red Ant acts like a shark, with pretty high attack and low defense, but unengaged, they can be mostly ignored. Obviously, the Ants work better against melee figures, but not so much as you might expect. If you can engage ranged figures, and keep them engaged, it’s easy to take them down. In Heat of Battle the ants can be devastating if your opponent doesn’t place carefully. To help keep the Ants engaged, I like pairing them with Marcus for an extra move, and road maps always help them as well. The best army that I found for Ants was usually 3-4 squads of Ants, and then adding Raelin, Syvarris, MDG, KA, or others to fill your point total. Less than 3 squads of Ants is not very effective, and 5 fills your start zone most of the way, which doesn’t leave a whole lot of room for anything else. My favorite strategy with the Ants was (especially against melee armies, such as Cathar Spearmen or Phantom Knights) to let the action take place closer to the Ants’ starting zone, allowing for your Ants to continue to move up as they were killed. When they were able to stay close to the action, the Ants could take down even ranged squads like Microcorp Agents or Havech Eradicators, but when they overextended, they were easy to beat. All in all, I loved the Red Ants and the decisions they forced, and think they absolutely deserve their place in Valhalla. I vote to induct the Red Ants of Aunstrom into the Soldiers of Valhalla. Oooooh. 2 yeas in the same day. This pleases me. The Deathborg faction has grown in size and strength in the era of Fanscape with the additions of the Zettian Infantry and Deathcommander Mark 3. Warden 722 works alongside these additions to give your army even more punch. There are a number of Unique Heroes in the 75 point price range with various abilities. For a simple comparison, let's look at Warden 816. Stat-wise they are similar, with 816 having a bit more range but costing more. In terms of raw stats I wouldn't say that the +2 Range is worth +15pts, but 816's Guard Leadership makes up the difference. It's difficult to make comparisons beyond that since they have different uses, but in terms of raw stats 722 isn't out of line. The "816" designation of the official Warden certainly suggests that he (it?) is not the only prison-keeper on Isadora. It's nice to see another. A gun that stuns opponents is quite fitting for one in such a position. It is strange that zapping one member of a Unique Squad "stuns" the other members, but that's hardly anything new in Heroscape (see Mind Shackle and Rod of Negation). Maybe they're too surprised and terrified to react. The miniature, while it does have a touch of stormtrooper in it if you look hard enough, does not obviously appear to be a Star Wars figure and looks natural alongside the Deathborgs. I know I would feel intimidated if I was locked up in his prison. Electrical Pulse Special Attack is reminiscent of the official Silver Surfer's Cosmic Force Blast Special Attack, in this case giving up a good deal of power for much greater stun consistency. That's something that bothered me actually; normally powers like this would come with a d20 roll for the effect. In this case the low range and low attack power (presumably) make up for that. It never really felt right that the stun was an automatic effect. Uniques in Heroscape have traditionally had it rough. There are lots of powers that affect only Unique Heroes, and Unique Squads usually suffer when they lose even one figure. I can't say I'm thrilled to see another unit that punishes Uniques, and even more so that it does not punish the types of Unique Heroes you commonly see on the battlefield: bonding heroes and cheerleaders. In metagame terms we already have a lot of Unique counters. That said, the Deathborg army really doesn't have anything particularly good anti-hero (no, Maul isn't good), so this is one place I could see the need for such a unit. Warden 722 plays pretty much exactly how he looks on paper. His fairly short range tends to bring him closer to the fight than most range figures would prefer to be, with some tough defenses to keep him alive (but could crack at any time). He isn't the strongest option to bond with the Zettian Infantry but he provides a decent bonding option for the price. His price also helps him squeeze into Deathcommander armies. Uniques that require order markers do not like him. Three attack is only mediocre, but if it does get past the Defense roll it does damage and kills an order marker. If the big Warden is close enough to be using Electrical Pulse, it's highly likely a lost turn will really hurt. It does make Warden 722 a priority target in some situations, but not usually enough to want to overextend for. It does give the Warden another interesting use: as a defender, of a sort. Or more specifically, a cheaper unit that draws fire away from costlier targets such as Deathcommander or a Deathwalker. As I mentioned before, I was never really keen on Electrical Pulse not requiring a d20 roll, but I can't say it doesn't work as-is. If your Feral Troll is going one-on-one against him you'll probably be miserable, but such matchups aren't terribly common and Heroscape has a few such things already. Losing turns isn't the funnest thing, but I didn't find it too common in a normal game. Note that the short Range of 3 of Electrical Pulse is a significant detractor to its usefulness. I'm not particularly excited to see another anti-Unique unit, but the game does have a place for them. Warden 722 is simple, effective, and works as a nice complement to the other Deathborgs. I vote to induct Warden 722 into the SoV. Last edited by Scytale; September 26th, 2014 at 01:58 PM.